- It's also the brightest flashlight / torch on the market, because the camera led emits very intense light in the dark. * Camera LED light - Uses your phone's camera led (flash) to emit bright light. Note that some devices don't have a camera flash. In this case the led flashlight option will be disabled, but you can still use one of the screen lights. 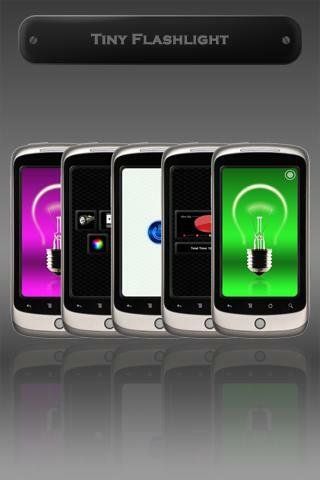 * Screen Light - This is the basic white screen light, which is bright enough for daily use. You can use it as your primary option in case your device doesn't have a camera led or you want to save the battery. * Warning Lights, Police Lights, Color Light - Different light sources, which may be useful in many situations. You can change the brightness and the colors. Tiny Flashlight is one of the few applications on the market, which is free and has different widgets to choose from when the device has an option for a led light. Add a widget by tapping and holding on your main screen. - In order to start the camera led (flash) on some devices, Tiny Flashlight has to use a small part of the camera hardware and it needs this permission. Don't worry, I'm not taking any pictures or videos without your permission. Tiny Flashlight is just accessing the camera led (flash). - This is the old method of accessing the camera flash on Android 1.5 and 1.6. *** As you know, Tiny Flashlight is free, but also is one of the best supported apps on the Android Market. Currently, this is the only app that supports almost all devices with camera led (flash) and fully supports all versions of Android (1.5, 1.6, 2.0, 2.1, 2.2, 3.0). This takes huge amounts of time and effort and in order for Tiny Flashlight to remain the best flashlight on the market, I have to use ads inside it. The following permissions are required by Google's own ad provider (Admob) and Millennial Media (the biggest independent ad network). Both are respected industry leaders. - Used to load ad info from their servers. Nothing more. - Temporary caches some ads on your SD Card. This method is used to save bandwidth. - Some Motorola devices have factory bugs. These devices don't have unique IDs and this became a problem for ad networks, because they can't function without it. There is a workaround for this problem by using the PHONE IDENTITY permission. This permission is used only for getting a unique id. Nothing more.